During routine traffic stops, police officers sometimes end up arresting individuals for the third-degree felony offense of Tampering with Evidence. How does this happen you ask? If, during the course of a traffic stop, an officer observes the driver toss an item or two out of the window, and those tossed items are later determined to be drugs and/or drug paraphernalia, the officer might just arrest the person for tampering with evidence pursuant to section 37.09 of the Texas Penal Code. The important question though, is whether section 37.09 was intended to prohibit this type of conduct? What is the Purpose of Section 37.09 – Tampering with Evidence? (2) makes, presents, or uses any record, document, or thing with knowledge of its falsity and with intent to affect the course or outcome of the investigation or official proceeding. Texas courts have found that the purpose of section 37.09 is to uphold the integrity of our criminal justice system. 20 Tex. Jur. 3d Criminal Law: Offenses Against Public Administration § 63 citing Wilson v. State, 311 S.W.3d 452 (Tex. Crim. App. 2010); Haywood v. State, 344 S.W.3d 454 (Tex. App.—Dallas 2011 pet. ref’d). This includes prohibiting anyone from “creating, destroying, forging, altering, or otherwise tampering with evidence that may be used in an official investigation or judicial proceeding.” Id. However, section 37.09 is not without limitation. What is the Scope of Section 37.09? Early case law suggests the scope of 37.09 is very limited. But, as you will read below, the Court of Criminal Appeals rejects this notion by allowing the fact finder the ability infer the intent to tamper. In Pannell v. State, 7 S.W.3d 222 (Tex. App.—Dallas 1999, pet. ref’d) the court of appeals held that section 37.09 requires a defendant to know that the item “altered, destroyed, or concealed, was evidence of an investigation, that is pending or in progress, as it existed at the time of the alteration, destruction, or concealment.” Id. In this case, the defendant threw a marijuana cigarette out of the window while he was being pulled over for speeding. Id. Because the officer was only investigating a speeding violation when the defendant threw the marijuana out of the window, the court held that there was no evidence that an investigation in which the marijuana would serve as evidence was “pending or in progress.” Id. The court explained that only after the officer observed the defendant throw out the marijuana did the investigation change to involve drugs. As a result, the court determined there was no evidence of tampering. This analysis, however, has been rejected, albeit not explicitly overruled, in Williams v. State, 270 S.W.3d 140 (Tex. Crim. App. 2008). In Williams, an officer was conducting a traffic stop and decided to conduct a pat down search of the driver (i.e. defendant) for weapons. During the pat down a crack pipe fell onto the pavement, and the defendant immediately stomped on the pipe, crushing it with his foot. When deciding whether or not the above actions constituted tampering, the Court of Criminal Appeals rejected the lower court’s analysis, which stated that the traffic stop became a drug investigation once the officer and the defendant noticed the pipe on the pavement, and only then was there tampering. In rejecting this analysis, the Court held that requiring a change in the investigation, as the appellate court’s analysis and Pannell does, adds an additional mens rea element not required by section 37.09. Thus, the Court held that when an officer is investigating a traffic stop and the suspect anticipates that the officer will begin a drug investigation if the officer finds evidence of drugs, and in accordance with that anticipation, the suspect destroys the drugs before the officer becomes aware of them, the suspect has tampered with evidence. As such, there is no requirement for the officer to “see the pipe” or “see the marijuana” before the suspect throws it out of the window in order for that action to constitute tampering. The determination will be made by the finder of fact using circumstantial evidence to draw inferences. In conclusion, if the only evidence the State has of tampering is the fact that the defendant threw the item out of the window, without any other indicia of tampering, then the act alone does not rise to level of tampering under section 37.09. However, there are many reasonable circumstances, ever so slight, that could lend the fact finder to make an inference of intent to tamper. With that being said, because the offense of tampering is extremely fact-based, we recommend you reach out to our experienced attorneys to better understand your options. CBD Oil, which is short for cannabidiol oil, is a cannabinoid extract that is alleged to have the health benefits of cannabis (e.g. pain relief, easing of inflammation, anxiety management and the treatment of epilepsy) without the psychoactive effects of marijuana. CBD Oil is sold as a supplement in marijuana dispensaries, nutrition stores, and even as an additive in smoothies. While the popularity of CBD Oil is growing substantially, the product remains unregulated by the U.S. Food and Drug Administration, leading to wide discrepancies in the product’s ingredients and quality. The variety of ingredients and compounding methods may have significant ramifications for consumers depending on Federal and state law and the interpretation of those laws by state law and health code enforcement agencies. Is CBD Oil Legal Under Federal Law? Yes, if it is produced within federal guidelines. As of December 20, 2018, the Fed Gov has legalized hemp that has a tetrahydrocannabinol (THC) concentration of no more than 0.3% by removing it from Schedule I of the controlled substances act. States and Indian Tribes may regulate the production of Hemp by submitting a plan to the USDA. This bill also makes hemp producers eligible for the federal crop insurance program and certain USDA research grants. 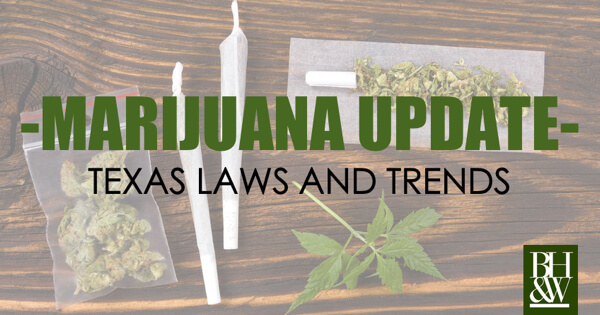 With the passing of the new 2018 Farm Bill, hemp and hemp-derived products have been officially removed from the purview of the Controlled Substances Act, such that they are no longer subject to Schedule I status. Meaning that so long as CBD is extracted from hemp and completely pure (with less than 0.3% THC on a dry weight basis of THC, something the DEA doubts is possible) and grown by licensed farmers in accordance with state and federal regulations, it is legal as a hemp product. Is CBD Oil Illegal Under the Laws of the Various Individual States? Yes, CBD is legal, but not in all states. At the state level, CBD Oil is considered legal in the states where marijuana is legal for recreational use (Alaska, California, Colorado, DC, Maine, Massachusetts, Nevada, Oregon, Vermont). Twenty-nine states have made marijuana legal for medical use in various quantities and CBD is also considered legal under those state laws, irrespective of the THC content of the source of the oil. In states that have not decriminalized marijuana, CBD Oil is also likely illegal. NO, unless you fall within the qualifications set by the Compassionate Use Act. If you are prescribed the use of medical CBD oil and use ‘low-THC” CBD, then the use is legal. Texas has legalized marijuana for medical use only, but only in a very narrow set of circumstances. The Compassionate Use Act of 2015 authorizes the prescription of “low-THC cannabis,” defined as having no more than 0.5% THC for patients diagnosed with intractable epilepsy and entered into the state-maintained “compassionate-use registry.”3 The Act requires prescription by two physicians however, it is currently illegal under federal law for a physician to “prescribe” marijuana. Under a 2000 court ruling, it is legal for physicians to “recommend” marijuana to their patients but the language of the Compassionate Use Act calls for a prescription, setting up a conflict with Federal law.4 Additionally, to qualify for the medical use of CBD, the patient must have tried two FDA-approved drugs and found them to be ineffective. There are currently three dispensaries licensed by Texas to sell qualifying products to authorized consumers. 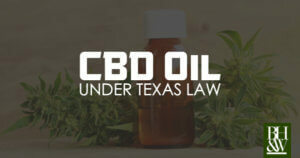 If you do not fall within the qualifications set by the Compassionate Use Act, then possession of CDB oil containing any amount of THC is against Texas law. The State definition of marijuana closely tracks the Federal definition. 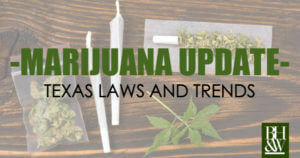 The Texas Health and Safety Code defines marijuana as “the plant Cannabis sativa . . . and every compound, manufacture, salt, derivative, mixture, or preparation of that plant or its seeds.” The Code excludes “the mature stalks of the plant or fiber produced from the stalks [and] a compound, manufacture, salt, derivative, mixture, or preparation of the mature stalks, fiber, oil.” Texas does not currently have legislation allowing for the cultivation of hemp, though industrial hemp derived from the mature stalks of the Cannabis sativa plant may be sold and consumed. What is the Penalty for Possession of CBD Oil in Texas? In Texas, if you possess CBD oil with any trace of THC, you could be charged with a Felony for Possession of a Controlled Substance in Penalty Group 2, which (depending on the weight in grams) can carry a range of punishment from 180 days in a state jail facility up to 20+ years in prison and a fine not to exceed $10,000. Several of our clients have been arrested for possessing CBD oil after officers performed a field test and discovered that yielded a positive result for THC. If the CBD oil does not contain any THC, is it currently a Schedule V substance not in any penalty group. Possession of CBD with no THC can be charged as a Class B Misdemeanor with a punishment range of 0 – 180 days in jail and a fine up to $2,000. CBD Oil made from the mature stalks of the Cannabis sativa plant are likely in conformity with both Federal and Texas State law. Consumers seeking to purchase CBD Oil in Texas should look for a product advertised as being the product of “industrial hemp” or “mature hemp.” Products advertised as containing “THC” or “CBD Oil” should be avoided because of potential conflict with State and Federal laws. Texas consumers with intractable epilepsy may seek to join the Compassionate Use Registry and get a prescription for CBD Oil containing less than 0.5% THC from an authorized dispensary. 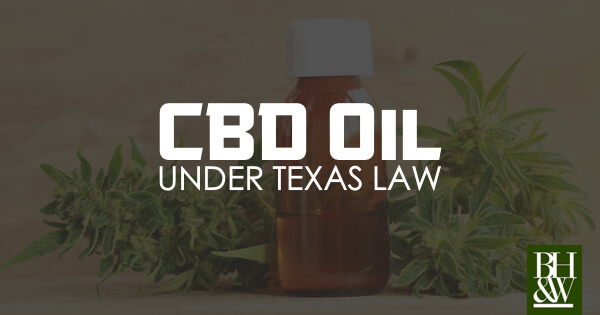 Physicians should be mindful that “prescribing” CBD Oil to Texas residents under the Compassionate Use Act may fall into conflict with existing Federal law. Retailers that are not one of the three state-authorized dispensaries authorized by the Compassionate Use Act should take care to carry only products that do not advertise themselves as containing CBD Oil but instead focus on being the product of industrial hemp. Where Can I Purchase CBD Oil with 0% THC? While there are many CBD oil stores popping up all over Texas, we have found one near our office that sells CBD Oil with 0% THC in it. They test it to confirm the THC content so that you can be sure of what you are getting. Visit Your CBD Store at https://yourcbdstorekeller.com to learn more or purchase their CBD products online. But remember that even though many agencies are not choosing to arrest or prosecute for zero THC CBD oil, the Tarrant County DA’s office is still filing these cases if a person is arrested. H.R.2642 – 113th Congress (2013-2014): Agricultural Act of 2014. Many retailers slash their prices and offer steep discounts in the weeks leading up to Christmas and even bigger discounts after Christmas, but we have yet to see any retailer offer the “five finger discount” for their merchandise. Regardless, we see plenty of shoplifting cases during the Christmas season, making it our #5 reasons that people get arrested during Christmas. Depending on the regular price value of the item (not the discounted price), shoplifting theft charges can range from misdemeanors to felonies. Learn more about Theft law in Texas here. In a similar vein to shoplifting, our #4 reason for holiday arrests is package theft. Many shoppers choose the convenience of online shopping and have their Christmas purchases delivered right to their front door. Some people see this as an easy target, following behind UPS or FedEx trucks to steal those would-be Christmas gifts from the front porch. However, with the increase in doorbell cameras, it is getting easier to catch the porch pirates in the act. Further, some law enforcement agencies have begun using dummy packages to bait thieves into getting caught. Package theft can range from a misdemeanor to a felony depending on what unknown treasure lay inside the brown box. Possession of a Controlled Substance (CBD oil, THC oil, marijuana, etc.). Even if the state from which a traveler is coming has legalized marijuana and the state to which they are traveling has legalized marijuana, if they are caught possessing marijuana in the airport, they will be arrested and charged. The combination of airport gun arrests and airport drug arrests make these types of cases our #3 reason for holiday arrests. In the movie Christmas Vacation, Clark Griswold showed an enormous amount of restraint when his extended family pushed him to the limit (especially Cousin Eddie), but not everyone is blessed with such a cool head. Christmas time brings added stressors into the family environment that can sometimes lead to verbal or physical altercations between family members, so much so, that these arrests rank at #2 in our book. Depending on the nature of the assault, a domestic violence arrest can be charged as a misdemeanor or a felony. Learn more about Family Violence under Texas law. With all of the Christmas and New Year’s parties and the increase in No Refusal Weekends, it is not hard to guess that DWI arrests are #1 on our list. Driving While Intoxicated in Texas can range from a misdemeanor (if it is a first or second offense) to a felony (if there is a child in the car or if the person arrested has been convicted of DWI twice in the past). Our advice is to plan ahead and do not even take your car to a Christmas party when you plan to drink. Catch a ride from a friend or take an Uber or Lyft. That would be a lot cheaper than hiring an attorney and a lot less hassle too. Learn more about Texas DWI law here. We Hope You Never Need Us, But We’re Here if Your Do. We wish you a very merry Christmas and a happy New Year. As always, we hope you never need us to represent you or one of your loved ones for a criminal offense. This is even more true during the Christmas season. Hopefully this list will help you avoid trouble that looms during the holiday season. If you do happen to need us, we are only a phone call away at (817) 993-9249. Can a Bus Driver Give Consent to Search the Passenger Compartment? FACTS: In this case, police officers were conducting bus interdictions at a Greyhound bus stop. After a certain bus stopped, the driver got off the bus and the officers approached him requesting consent to search the passenger cabin of the bus. The bus driver consented to a search and two experienced narcotics officers in plain clothes boarded the bus. The officers did not block the exit or otherwise obstruct any of the passengers from departing the bus. One officer walked to the back of the bus while the other officer remained at the front. The officer at the front of the bus noticed a man who was pretending to be asleep. The officer found this suspicious, because in his experience, criminals on buses often pretended to be asleep to avoid police contact. The officer walked past the “sleeping” man and turned around. The sleeping man (named Morris Wise) then turned to look back at officer, revealing that he was not asleep after all. The officer then approached Wise (now awake) and asked to see his bus ticket. Wise gave the officer a bus ticket, bearing the name “James Smith.” The officer had a hunch that James Smith was a fake name. The officer then asked Wise if he had any luggage with him on the bus. Wise said yes and motioned to the luggage rack directly above his head. Wise then gave the officers consent to search the duffle bag in the overhead compartment. The officers did not find any contraband in the duffle bag. The officers also noticed a backpack near Wise and asked if the backpack belonged to him. Wise denied ownership of the backpack. The officers then asked the other passengers about the backpack and no one claimed it, so the officers removed the backpack at the bus driver’s request. Outside the bus, a trained police canine alerted to the backpack. The officers then cut a small lock off the backpack, searched it, and found seven brick-type packages that appeared to contain cocaine. The officers then went back onto the bus and asked Wise if he would mind getting off the bus to speak to the officers. Wise complied with the officers’ request and got off the bus. The officers asked Wise if he had any weapons, which he denied that he had any weapons, and then they asked him to empty his pockets. From his pockets, Wise gave the officers his ID card with bearing the name “Morris Wise” and a lanyard with several keys attached to it. Not surprisingly, one of the key opened the lock that the officers had to cut off of the backpack (that Wise said was not his). The officer then arrested Wise, and the government charged him with several drug-related offenses. Wise filed a motion to suppress the evidence as a violation of his 4th amendment right against unreasonable searched and seizures. 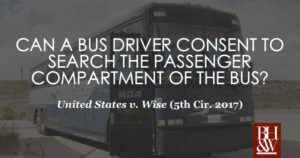 The district court held that the officers’ conduct in searching the bus constituted an unconstitutional checkpoint stop. In addition, the district court held that the bus driver did not voluntarily consent to the officers’ search of the luggage compartment where the backpack was located. As a result, the district court suppressed all evidence the officers seized after the stop. The government appealed to the Fifth Circuit Court of Appeals. Second, although Wise had a reasonable expectation of privacy in his luggage, the court held that as a passenger, Wise did not have a reasonable expectation of privacy in the luggage compartment of the commercial bus. 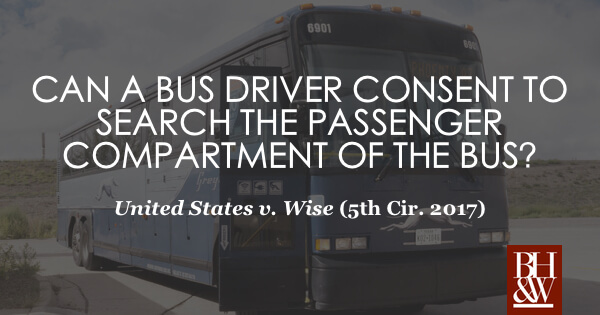 As a result, the court concluded that Wise had no standing to challenge the officers’ search of that compartment, to which the bus driver consented. Third, the court held that the officers did not seize Wise, within the meaning of the Fourth Amendment, when they approached him, asked to see his identification, and requested his consent to search his luggage. Instead, the court concluded that Wise’s interaction with the officers was a consensual encounter because a reasonable person in Wise’s position would have felt free to decline the officers’ requests or otherwise terminate the encounter. Finally, the court held that Wise voluntarily answered the officer’s questions, voluntarily emptied his pockets, and voluntarily gave the officer his identification and keys. Can a Defendant Be Convicted for Using a “Fraudulent Prescription Form” When They Only Altered the Information on an Otherwise Valid Prescription? In 2012, the Texas Court of Criminal Appeals released an opinion concerning whether a defendant may be convicted under Texas Health and Safety Code Section 481.129(a)(5)(B) for using a “fraudulent prescription form” when the facts showed that the defendant altered the dosage information on an otherwise valid prescription that had been written by the defendant’s physician. In 2009, Defendant received a prescription for forty 2.5-milligram Lortab pills from her doctor after she complained of knee and back pain. Before dropping off the prescription at the pharmacy, Defendant attempted to scribble out the “2.5” and make it look like “7.5.” The pharmacist became suspicious and called the doctor’s office to confirm the prescription. The nurse confirmed the Defendant’s prescription was for 2.5-milligram pills and the pharmacist called the store security, who then contacted police. During trial in which the defendant had been charged with using a fraudulent prescription form, Defendant moved for a directed verdict of acquittal. Defendant argued that, while there was evidence of forgery, there was no evidence that she used a “fraudulent prescription form” as alleged in the indictment. Defendant further argued that the prescription form was not fraudulent, but only that what the doctor wrote was altered. Therefore, there was no evidence that Defendant committed fraud by using a fraudulent prescription form. However, the State responded that even by altering an otherwise legitimate prescription form, as Defendant did when attempting to change the dosage, Defendant had created a fraudulent prescription form. The trial court denied Defendant’s motion and the jury found Defendant guilty. Defendant was sentenced of 25 years’ confinement and a $1,500 fine. Section 481.129 of the Texas Health and Safety Code governs the offense of fraud under the Texas Controlled Substances Act. According to Section 481.129(a)(5)(A), a person commits an offense if they possesses, obtains, or attempts to possess a controlled substance by misrepresentation, fraud, forgery, deception, or subterfuge. Section 481.129(a)(5)(B) differs slightly in that a person commits the offense if they possess or attempt to possess a controlled substance through the use of a fraudulent prescription form. Section 481.075 of the Texas Health and Safety Code governs the “Official Prescription Program,” which prescribers must follow in order to prescribe Schedule II Controlled Substances. This section describes the elements of an “official prescription form” as the controlled substance prescribed as well as the quantity of that controlled substance. The State argued that since the prescriber’s written words are part of the “official prescription form,” the Defendant turned the entire document into a “fraudulent prescription form” when she altered the written words. Accordingly, the Court of Appeals vacated the trial court’s judgment and entered a verdict of acquittal. The Court of Criminal Appeals first addressed factual matters in the Court of Appeals’s opinion. Beginning with discussing the original indictment, it did not specify which Schedule of controlled substance Lortab is on. The Court of Appeals identified it is a Schedule II controlled substance, but also cited to definitions that describe Lortab as a combination drug that may be Schedule III. The pharmacist’s testimony identified Defendant’s Lortab as a Schedule III controlled substance mixture. The Court of Criminal Appeals analyzed how the Court of Appeals discussed the history and intent of the statutes, and determined that, based on statutory inferences and common language, “prescription form” refers to a pre-printed form that is used to write information on it. Further, the Legislature intended to create a legal distinction between completed prescriptions and the prescription forms. 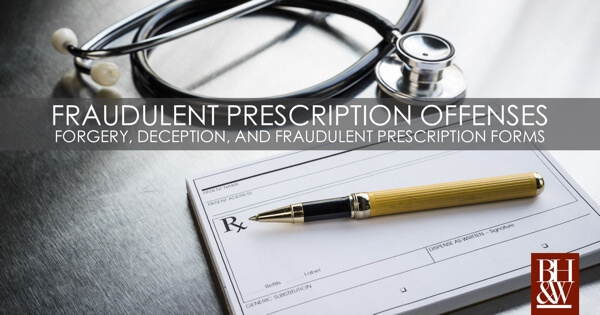 After analyzing the statute applied in the Court of Appeals, the Court of Criminal Appeals determined that Subsection (B) of Section 481.129(a)(5) only governs the use of a fraudulent prescription form. Further, the Court of Criminal Appeals ruled that the writing on the form is not an element of that offense. In the case at hand, the State originally charged Defendant with attempting to obtain a controlled substance “through use of a fraudulent prescription form.” The evidence presented by the State adduced that Defendant fraudulently altered the information written on the legitimate prescription form. Although the evidence would have supported a conviction had Defendant been charged under another statute, the evidence does not support a conviction for the offense Defefndant was charged with. Although the Court of Criminal Appeals disagrees with the reasoning of the Court of Appeals, it agrees in its judgment and affirms the Court of Appeals’s judgment of acquittal. 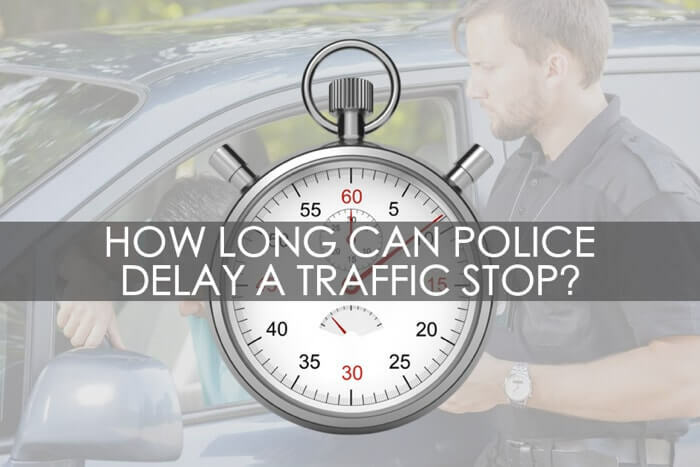 How Long Can an Officer Wait to Pull a Vehicle Over After Observing a Traffic Violation? In this case, a San Antonio police detective, who was working with an informant, suspected that Appellant Zuniga was transporting methamphetamine in his vehicle and followed it. The detective witnessed the driver of the vehicle fail to engage the turn-signal as required. He did not pull the vehicle over at that time, but radioed the traffic violation to other officers. Approximately fifteen minutes later, an officer who had received the radio dispatch but had not witnessed the turn-signal violation, stopped the vehicle. During the stop, the officer encountered Appellant, who was riding in the passenger seat, and his girlfriend, who was driving the vehicle. The officer arrested Appellant on outstanding warrants and his girlfriend for driving without a valid driver’s license. The arresting officer conducted a search of Appellant incident to arrest and found methamphetamine on his person. The officer also searched Zuniga’s car and found a backpack containing methamphetamine, a handgun, and other evidence related to drug trafficking. As a result, the federal government charged Appellant with several drug-related offenses. Appellant filed a motion to suppress the evidence seized during the stop, arguing that the fifteen-minute delay in conducting the stop for the turn-signal violation rendered the information provided by the detective who observed the violation stale. The trial court denied the motion to suppress, holding that the delay in conducting the stop was not enough to render the information stale or the stop unlawful. The court did not state a specific time limitation to which officers must adhere when conducting a traffic stop. Instead, the court stressed that stops following traffic violations must be reasonable in light of the circumstances. In this case, the court found that the fifteen-minute delay was reasonable. As soon as the officer observed the turn-signal violation, he immediately relayed this information to other officers, although none of those officers were in position to stop the vehicle at that time. The trial court further held that the collective knowledge doctrine allowed the arresting officer to lawfully stop the vehicle even though he did not personally observe the traffic violation. The collective knowledge doctrine allows an officer, who does not observe a criminal (or traffic) violation, to conduct a stop when that officer is acting at the request of another officer who actually did observe the violation. Here, the detective who observed the turn-signal violation communicated this information to the traffic officer who ultimately stopped the vehicle; therefore, the detective’s knowledge transferred to the officer who conducted the stop and made the arrest. 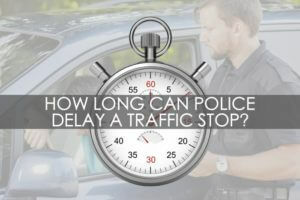 When Does a Traffic Stop End and Improper Police Conduct Begin? A Traffic Stop for a Minor Traffic Infraction Leads to Search, Seizure, and Arrest: Exactly When Should Traffic Stops End? If you’ve been a licensed (or even unlicensed) driver in Texas for long enough, you’ve experienced a traffic stop. Whether it be for speeding or something worse, a traffic stop is not generally a pleasant experience. But in some traffic stops across the state (hopefully not yours), the police conduct a search of the vehicle, then a search of the driver or passengers, and, finally make an arrest of some sort. How does something like a broken tail light or speeding lead to search, seizure, and arrest? 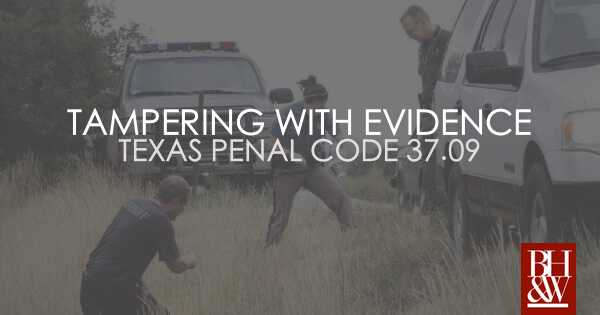 When traffic stops for minor infractions potentially lead to serious criminal charges, it’s important to know how Texas courts define the moment when a traffic stop ends. Around 1:00 am, Jennifer Dowling drove Christopher King’s car home from a night on the town. Blue Mound Police noticed that the car had a broken right tail light and conducted a traffic stop pursuant to the infraction. Police ran the standard background check on Dowling, the driver, and King, the passenger, only to discover that neither had a valid driver’s license. As a result, Dowling was arrested for driving without a license. Police did not permit King to drive the car away and informed him that they would impound the car because leaving the car behind posed a safety hazard for other motorists. To begin the impounding process, police asked King to exit the vehicle. When King got out of the car, police asked if they could perform a pat-down. Nervously, King complied with the request. When King stood up, a white cylinder-shaped container fell out of King’s pants onto the ground, and he admitted that the container held meth. King was arrested and charged with possession of a controlled substance. Before trial, King filed a motion to suppress the physical evidence—the meth and the container—because the evidence was seized without a warrant. At the suppression hearing, the State prevailed, arguing that King consented to the pat-down, and the interaction was a consensual encounter. King lost his suppression motion, and plead guilty to the charges. The trial court sentenced King to twelve years confinement. Arguing that the traffic stop ended when Dowling was arrested and that the traffic stop was improperly extended to him, King appealed to the Second Court of Appeals. The Second Court of Appeals in Fort Worth relied upon existing case law from the Supreme Court to evaluate the merits of King’s appeal. “A lawful roadside stop begins when a vehicle is pulled over for investigation of a traffic violation.” Arizona v. Johnson, 555 U.S. 323, 333; 129 S. Ct. 781,, 788 (2009). “A traffic stop ends when police have no further need to control the scene.” Id., 129 S. Ct. at 783. According to the Second Court of Appeals, the police needed to control the scene even after Dowling was arrested. In asking King for a pat-down, they were taking reasonable steps to secure the area by ensuring that King was not a safety threat while waiting for a tow truck. Further, “the impoundment of the vehicle was a task tied to the traffic infraction, and King ma[de] no argument that the task [of impoundment] should have reasonably been completed at the time the police asked for consent to the pat-down.” The Second Court of Appeals affirmed the trial court’s holding that the traffic stop was not improperly extended. What does all of this mean for motorists? So long as the police are reasonably securing the scene by taking steps in an effort to maintain safety, the police may continue the traffic stop until the conclusion of such safety measures, including but not limited to, pat-downs, security sweeps, background checks, and impoundments. In this case, King would have had a more colorable argument if he had been a licensed driver and the police extended the stop rather than letting him drive the vehicle away from the scene. Defendants Martel Barnes, Randale Jones, and Kentorre Hall were each charged with (1) conspiracy to possess illegal drugs, (2) maintaining a drug-involved premises, (3) conspiracy to possess firearms in furtherance of drug crimes, and (4) possession of a firearm in furtherance of a drug-trafficking crime for their involvement. In 2012, law enforcement grew suspicious of the group when investigating a triple murder where circumstantial evidence linked the Defendants to a network of drug trafficking in Mississippi, based out of a home rented by Hall. After interviewing witnesses and corroborating stories of informants, the Mississippi Bureau of Narcotics executed a search warrant on the home which netted firearms, digital scales, and plastic baggies. Law enforcement linked the drug trafficking to the triple murder by analyzing shell casings from the murder scene and comparing them with casings found during the search. In addition to the murders and the drug distribution ring, the men were eventually linked to a string of armed robberies. At trial, the Government called thirty-four witnesses in total. After hearing testimony for over a week, the jury found the Defendants guilty on all counts, and they were each sentenced to life in prison, followed by five years of supervised release. The Defendants appealed to the Fifth Circuit Court of Appeals, arguing insufficient evidence for each charge in the indictment. The Fifth Circuit had to determine whether a reasonable jury would have found that the evidence established the guilt of the Defendant(s) beyond a reasonable doubt. Below, we examine each charge and discuss the Court’s analysis of conclusions reached on appeal. Each Defendant was charged with conspiracy to possess illegal drugs, a violation of 21 U.S.C. §§ 841(a)(1) and 846. Under the law, it is unlawful for any person knowingly or intentionally to manufacture, distribute, or dispense, or possess with intent to manufacture, distribute, or dispense, a controlled substance; any person who attempts or conspires to commit any offense [herein] shall be subject to the same penalties as those prescribed for the offense, the commission of which was the object of the attempt or conspiracy. On appeal to the Fifth Circuit, the Defendants argued that the witnesses used by the Government at trial lacked credibility. The Defendants argued that the witnesses were criminals with their own convictions and that their testimonies should not have been used at trial. Here, the Fifth Circuit stated, “this argument holds no weight given the quantity and consistency of the evidence presented at trial.” Moreover, held the Court, “credibility issues are for the finder of fact and do not undermine the sufficiency of the evidence.” United States v. Morgan, 117 F.3d 849, 854 n.2 (5th Cir. 1997). The Court affirmed the district court’s holding regarding the conviction for this charge. Second, each Defendant was charged with maintaining a drug-involved premises pursuant to 21 U.S.C. § 856(a) and 18 U.S.C. § 2. Under this section of the code, it is unlawful to knowingly open, lease, rent, use, or maintain any place, whether permanently or temporarily, for the purpose of manufacturing, distributing, or using any controlled substance; whoever commits an offense…or aids, abets, counsels, commands, induces, or procures its commission, is punishable as a principal. “In determining whether a person maintained a drug-involved premises under Section 856, the Court typically considers whether a Defendant (1) has an ownership or leasehold interest in the premises; (2) was in charge of the premises; or (3) exercised supervisory control over the premises.” United States v. Soto-Silva, 129 F.3d 340, 346 (5th Cir. 1997). Surprisingly, the Fifth Circuit declined to resolve this issue, as the Defendants were “subject to criminal liability for aiding and abetting” Hall, who rented the house where the criminal activity had taken place. To prove up aiding and abetting, the Government had to have established that (1) the elements of the substantive offense occurred and (2) the Defendant(s) associated with the criminal activity, participated, and acted to help it succeed. United States v. Delagarza-Villarreal, 141 F.3d 133, 140 (5th Cir. 1997). The Defendants also appealed that the word “place” in the statute was ambiguous and therefore, should not have been applied to include their cars and the area surrounding their cars, where more incriminating evidence supporting this charge was eventually seized. The Fifth Circuit stated that according to the Oxford Dictionary, “the definition of ‘place’ is not limited to buildings or structures…[although] the term ‘premises’ is commonly defined as a house or building.” The Fifth Circuit held that the district court did not error when instructing the jury that “place” could mean “house” or the “yard area” [where cars are parked] around a house. The Fifth Circuit affirmed the Defendant-Appellants’ convictions. Does the Emergency Aid Exception Apply to Vehicle Stops? The Fifth Circuit Court of Appeals recently handed down an opinion dealing with the emergency-aid warrant exception and whether that exception extends to vehicular stops. The issue facing the court was whether a traffic stop of Appellant Toussaint to warn him that a gang member had ordered a hit on him was justified under the emergency aid exception to the Fourth Amendment. The court reversed the suppression order from the trial court holding that the emergency aid exception did justify the stop because this was a proper exigent circumstance. An FBI agent monitoring a wiretap overheard a suspected gang-member order his associate to kill Toussaint who could be found in a specific neighborhood driving a specific car, a silver Infiniti. Immediately the agent contacted a local police officer who met with several other officers to determine the plan to locate and warn Toussaint of the hit. The officers drive to the specified neighborhood and search for silver Infinities until they find one with an occupant leaving the neighborhood. The officers follow the vehicle, observe the driver, Toussaint, speeding and pull him over. Once pulled over Toussaint flees the officers on foot until he was caught and placed under arrest. During a search of Toussaint incident to arrest officers found a pistol and a bag of crack cocaine. The amount of time between the FBI agent overhearing the initial threat and Toussaint’s arrest was about 45 minutes. Toussaint was charged with drug and firearm violations. Toussaint filed a motion to suppress the evidence obtained from the stop arguing that the stop was not justified. The trial court granted Toussaint’s motion to suppress finding that the exigency of the emergency had expired by the time the officers stopped Toussaint. The court held that the emergency-aid exception extends to vehicular stops when under the circumstances of the need to assist persons with serious injuries or threatened with serious injury. 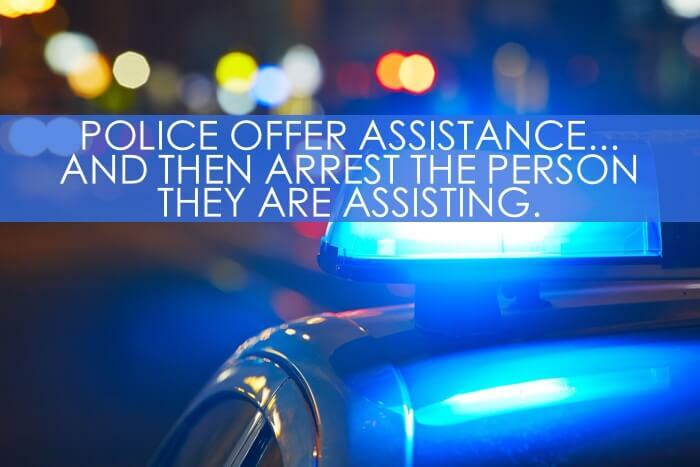 The emergency aid exception allows officers to conduct warrantless searches or seizures when there is a need to assist persons with serious injuries or threatened with a serious injury. Stuart, 547 U.S. 398 at 483. Under this exception, officers can enter areas they otherwise are not allowed in order to help someone. 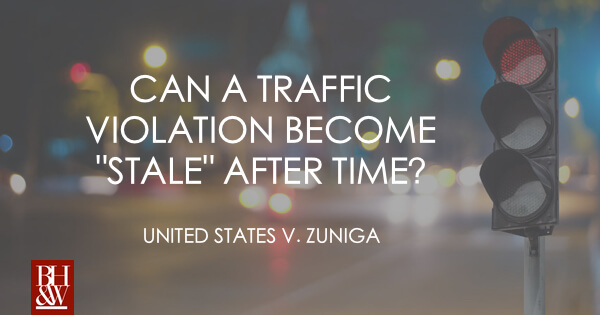 While the majority of such cases involve warrantless entries into homes, the court determined that there is no logical reason to not extend the exception to vehicular stops. Additionally, looking to reasonableness, “the ultimate touchstone of the Fourth Amendment,” the court stated “the benevolent act of trying to notify a driver that his life is in danger epitomizes reasonableness.” Thus, the court held that the emergency aid exception can be used to justify a traffic stop under proper exigent circumstances. Then, the court held that the exception applied in this case and officers were justified in stopping Toussaint. The court stated that trial courts must examine objective facts of the circumstance in determining whether there was an objectively reasonable basis for believing exigency actually existed. The officers’ subjective motivations are never relevant in the determination. When the officers received what all parties agreed was a credible threat against Toussaint, who was located in a specific neighborhood and driving a specific vehicle, the court held it was reasonable for the officers to believe there was a serious threat on Toussaint’s life. Further, that exigency still existed at the time of the stop because the threat on Toussaint’s life had not ended within the 45 minutes it took officers to locate him and warn him. Since the stop was justified the search was proper and evidence was legally obtained because it would be contrary to the needs of law enforcement to force officers to ignore evidence found when they stop vehicles to render emergency aid. In conclusion, the court held that the emergency aid exception extends to vehicular stops and that here, the stop of Toussaint was justified under this exception because there was a serious threat on his life. Accordingly, the court reversed the suppression order because the trial court was improper in granting the motion.